When a mysterious figure appears in Three Pines one cold November day, Armand Gamache and the rest of the villagers are at first curious. Then wary. Through rain and sleet, the figure stands unmoving, staring ahead. From the moment its shadow falls over the village, Gamache, now Chief Superintendent of the Sûreté du Québec, suspects the creature has deep roots and a dark purpose. Yet he does nothing. What can he do? Only watch and wait. And hope his mounting fears are not realized. But when the figure vanishes overnight and a body is discovered, it falls to Gamache to discover if a debt has been paid or levied. Months later, on a steamy July day as the trial for the accused begins in Montréal, Chief Superintendent Gamache continues to struggle with actions he set in motion that bitter November, from which there is no going back. More than the accused is on trial. Gamache’s own conscience is standing in judgment. In Glass Houses, her latest utterly gripping book, number-one New York Times bestselling author Louise Penny shatters the conventions of the crime novel to explore what Gandhi called the court of conscience. A court that supersedes all others. Sam Hill always saw the world through different eyes. 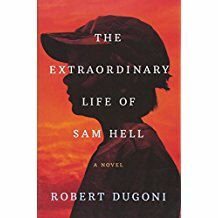 Born with red pupils, he was called “Devil Boy” or Sam “Hell” by his classmates; “God’s will” is what his mother called his ocular albinism. Her words were of little comfort, but Sam persevered, buoyed by his mother’s devout faith, his father’s practical wisdom, and his two other misfit friends. Sam believed it was God who sent Ernie Cantwell, the only African American kid in his class, to be the friend he so desperately needed. And that it was God’s idea for Mickie Kennedy to storm into Our Lady of Mercy like a tornado, uprooting every rule Sam had been taught about boys and girls. Forty years later, Sam, a small-town eye doctor, is no longer certain anything was by design—especially not the tragedy that caused him to turn his back on his friends, his hometown, and the life he’d always known. Running from the pain, eyes closed, served little purpose. Now, as he looks back on his life, Sam embarks on a journey that will take him halfway around the world. This time, his eyes are wide open—bringing into clear view what changed him, defined him, and made him so afraid, until he can finally see what truly matters.